From rolling hills and walking trails to award-winning wineries and the world class French Lick Resort and Casino, the Radius region is a destination of choice in Southern Indiana. Our area continues to grow in the number of tourism attractions and visitors. We boast nationally ranked golf courses, a thriving artisan community, and the charm of historic small towns. Low cost of living, easy interstate access, and a friendly business climate in the eight counties of the Radius region have made tourism one of our region’s fastest growing industries. 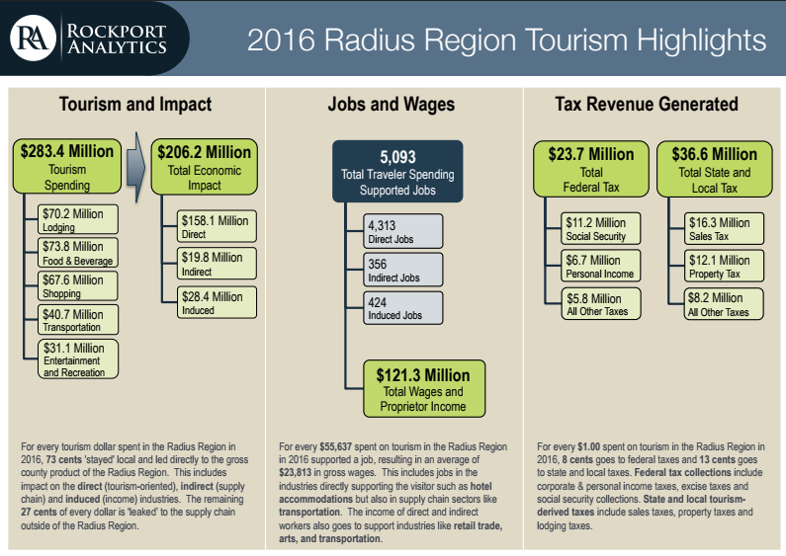 Data Update: Rockport Analytics has released the 2016 Economic Impact of Tourism in Radius Region report. The tourism economy continues to grow in the Radius Indiana region. Visitor spending in 2016 increased by $11.8 million from the previous year. Total visitor spending in 2016 was $283.4 million with an economic impact of $206.2 million to the region.